I am sorry for the delay in sending this Blog. We have had an exhibition of the work we have made during the residency, and with lots of entertaining besides, time has just evaporated. Yesterday I gave a talk as part of a series at the exhibition. I was asked to talk about Scotland and decided to tell the story of the evacuation of the Scottish Islands of St Kilda in 1928. This involved a lot of internet research to get good information, images and video. My feeling is that there are many similarities with the forced evacuations here in Fukushima as a result of the tsunami disaster 3/11. During the research my feelings were re-enforced many times. While the St Kildans chose to evacuate, the reasons were largely outside their control. The encroaching modern world and their awareness of their own precarious and simplistic life eroded their centuries-old community structure. The slow migration of younger people to Canada and America had started the decline. 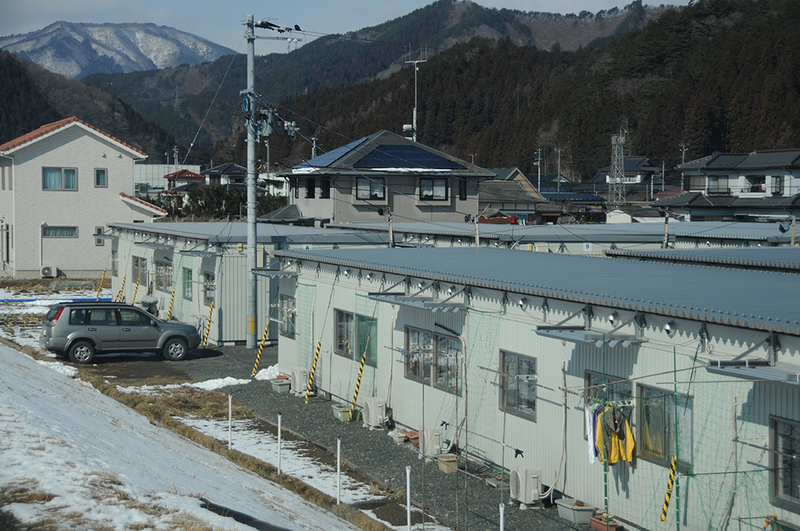 The subsequent handling of the financial and personal aspects of their re-homing was as complex, inefficient and time consuming, just as the process we are seeing here in Fukushima has been. And one can imagine that the success of the move for the St Kildans was as dependent on personal attitudes towards making a fresh start, as it is here with the Tohukans. The question my talk posed was basically … is it possible to go back and re create a shattered community? Will it be forever changed? Is a fresh start needed wherever refugees settle? Where is home? Does it lie in the past, or the future, or is it now? Our exhibition has been short but successful in that we have attracted many local people to come and join us. Some of us have always been on hand to welcome and chat to visitors, even if it was only to smile and use sign language. Part of the brief of this project was to help re-establish a cultural life in this area internationally blighted by the nuclear disaster which happened in an area hundreds of miles away but carrying the same Prefecture name. The two Norwegian artists and I seem to be the only westerners in town and as we were on TV together with our lead Japanese artist Yoshiko Maruyama early on we seem to be known wherever we go. The fact that we are holding the exhibition in the most historically important Kura has also attracted people who rarely get a chance to see inside this privately owned building. It is preserved but un-restored with no glass in doors or windows and only limited electricity, so a chilly place in sub zero temperatures. 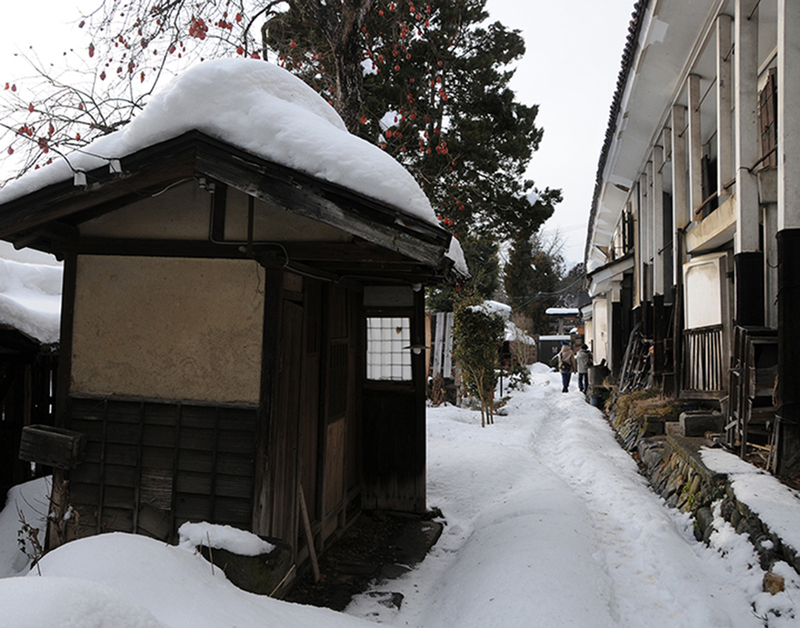 It is the largest Kura in town, being three separate Kura buildings linked together. A Kura is a traditional rice storage barn and, with the town being in the centre of a very large and fertile rice growing area, there are huge numbers. The Mayor told us there are estimated to be 20,000 Kuras in and near the city. There was a saying that every man born in Kitakata should build his own Kura, and with a current population of 40,000 the numbers still stack up. 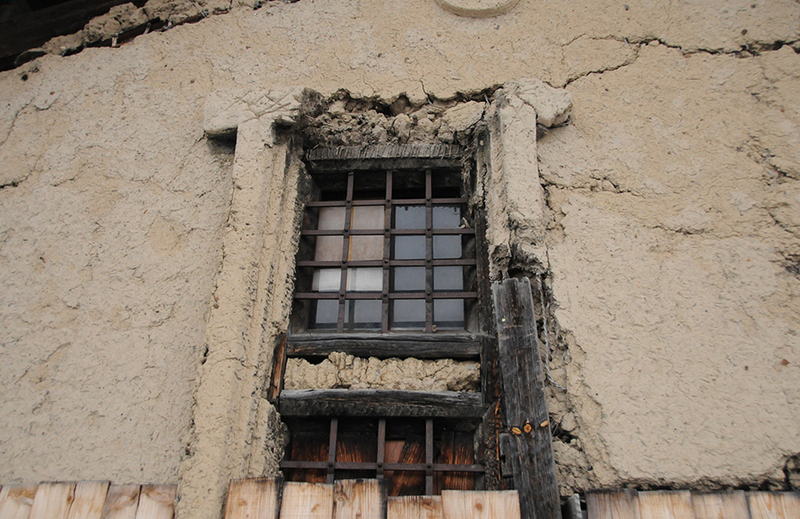 The massively thick doors and windows were a feature designed to protect against fire. Clearly with so much flammable material inside if one Kura went up in flames those adjacent would soon stoke the furnace and the whole city could be ablaze. But with solid doors and windows quickly closed the fire could be contained. 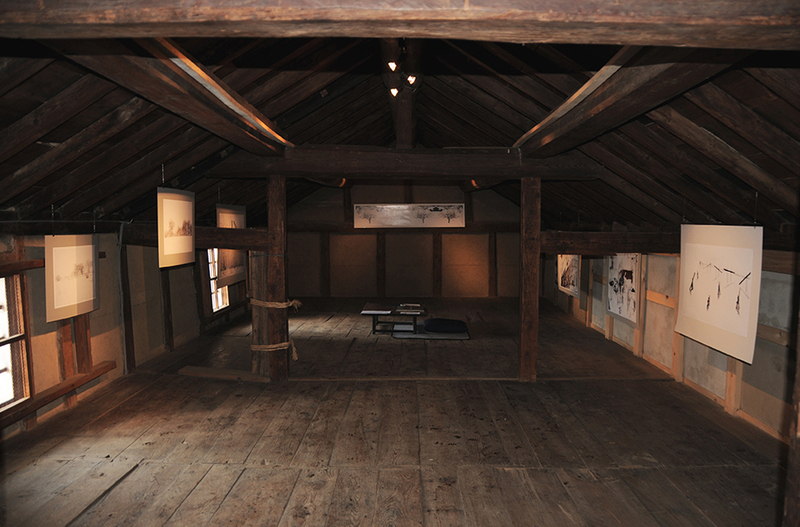 The walls are made of rice straw and mud with heavy wooden beam structures. 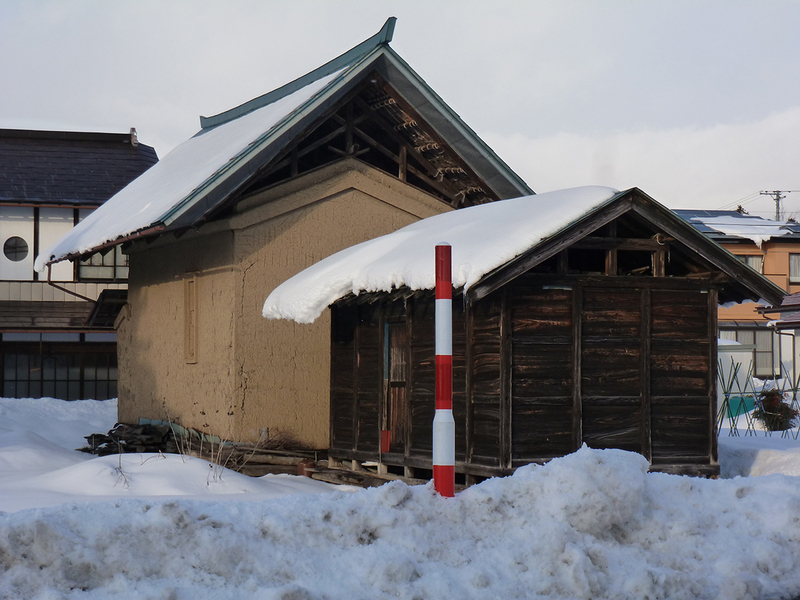 The roofs are today usually covered with shiny ceramic wave shaped tiles which allow the water and snow to run off, in particular snow doesn’t build up. Before that they were thatched with thick rice straw. The style is consistent and they have raised roofs with air space to allow good ventilation. I learned from artist Aeneas Wilder that even today in rural areas rats and the snakes they attract – the snakes eat the baby rats – are still a problem. Today the Kuras continue variously as conversions into housing, shops, offices, fire stations, and cafes. Some of course are in terminal decline and others just surviving. Bringing our art into this culture has been a unique experience. 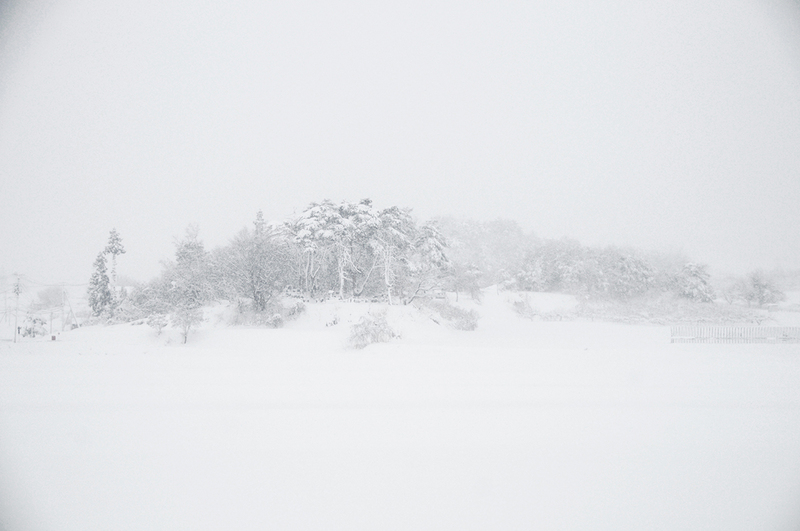 For my part having to decide early on in the residency what form my work would take, and with a requirement to connect with local issues, I decided to take an in-depth look at the snow that deeply covers this area. While snow of this depth was a great surprise to me I soon discovered that all of the local people and the refugees housed here really hated snow. They actually used that word ‘hate’ which is very strong in the Japanese culture who rarely show their feeling, especially negative ones, so easily. Could I make images that might show this element in a different light? 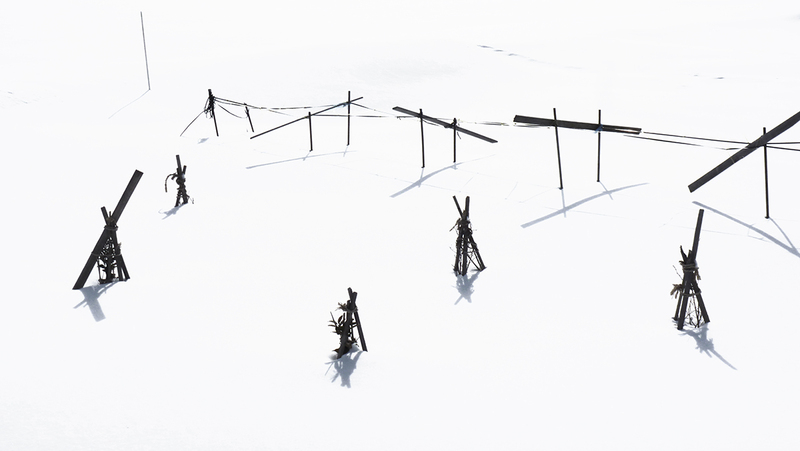 Avoiding the obvious ‘ touristic’ beautiful shrines in snow – although I couldn’t resist putting a few of those on Facebook – I looked firstly at the power of snow to remove landscape. All the human details of habitation, agriculture and communication and the cultivated land itself are simply removed from the landscape. What still shows are the clues or residues of our occupation and this concept fuelled my initial images made in the foothills of the mountains near the village in which we were staying. Then spending more time in town I was interested in the effects of snow on the light and the way that in turn affected window reflections. The Japanese have a habit of blocking out light – or maybe just prying eyes – with thin patterned curtains, adhesive patterned plastic sheets, cut glass, or with paint which often carries the scratches of wear and tear causing an interesting effect. The reflection of the snow and snow covered building in these semi-clear windows created many unusual layered views of these locations. I also began looking at the concepts of Japanese Sumi-e painting. 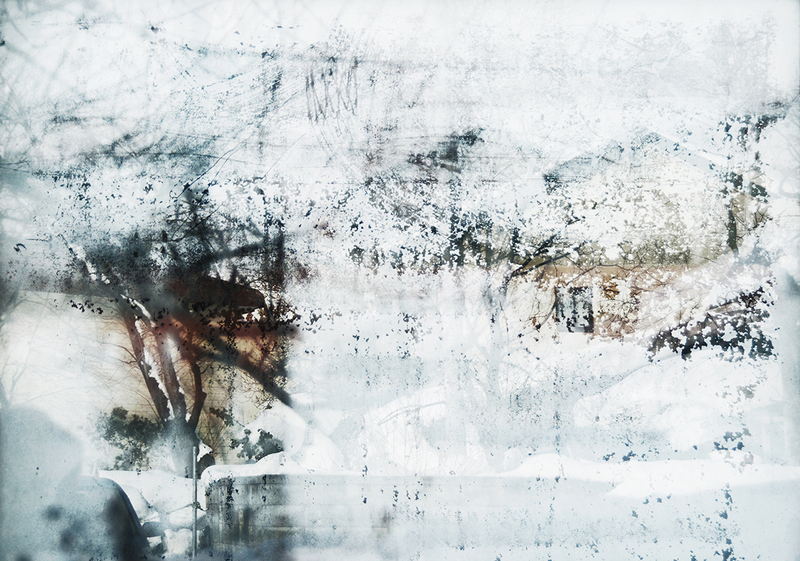 The ancient concepts of essence of place in which information was omitted and selected detail used to stand in for the whole, and of the broken paint technique which simply suggested form and movement through abstract marks seemed to have much resonance with the work I was making. And it began to direct my interest. I named my exhibition ‘link’ after one image in which by using computer rotation I created a long line of trees each linked by a single branch. This very much reflected the many conversation I have had with local people who talk much about the connection with nature and between the forces of nature. Many people live by these concepts in their daily life. Yoshiko, who knows my previous work, commented that I seemed to have moved away from my normally more conceptual approach into something more personal and free. She is probably right although I am still not entirely comfortable with that. It is the nature of residencies in another culture, they can break into your established patterns of thought and action if you are willing, like the Refugees, to let it happen. Thanks to Aeneas Wilder, a Scottish artist living further North in Japan, Su Grierson has been able to give us a sense of the changes to the landscape further up the coast. Once again she asked me to emphasise that she is only able to report what she is told and sees herself, and cannot verify anything. One of the most impressive aspects of Japanese society is the degree of tolerance, support and respect that is shown both to foreigners and within their own community. Partly this is a necessity in such a heavily populated country and also because of the practice of sharing their home with many generations of a family – as one person said ‘we don’t have much option, we just have to get along’. But it does go deeper than this with many traditional small actions of respect happening as an expected etiquette in daily life. While these can sometimes seem hierarchical and onerous to us they actually reinforce respect and usually have an inbuilt level of equality. Decision making likewise tends to happen through group discussions which allow everyone to speak and seeks a consensus view. Again to us with our western linear approach which often allows the strongest voice to become powerful, this consensus approach seems to be very time consuming and often ends without an apparent firm decision: it is circular and ongoing allowing for new opinions to come into play. I can see the benefit of the system even if I find it difficult. However I am hearing from a number of people how it was this system that failed Japan at the time of the disaster in March 2011. Such an unprecedented series of disastrous events need fast firm leadership and decision making especially when the good systems already in place to cope with normal tsunamis were overwhelmed by the scale of that one. And I am told that the Government of the day just didn’t have the mechanisms to cope. Following on from this I have had several conversations now and on previous visits to Japan about the Japanese approach to Charity. After the disaster the Government initially declined international aid when they actually desperately needed it. In this society accepting charity is seen as diminishing your own status, and giving charity as placing oneself in a superior position and taking on an elevated status. Some people in Japan were questioned and challenged for wanting to help the refugees. “Why are you doing it,” and, “You are only doing it for you own glory”. What this society does do is support those around them socially and in their own family which is seen as a mutual situation offering no advancement or diminishing of status. We could learn much from that. However it does create a certain tightness in society and a worrying distancing from the concerns and issues of the wider world. Last weekend I was invited to stay at the home of Scottish artist Aeneas Wilder and his Japanese wife Naoko and their children. They live near Hanimaki in Iwate Province, a three hour train journey north from Kitikata and much nearer the east coast. Aeneas kindly drove me through the mountains and out to the coast to visit the many areas decimated by the earthquake and tsunami. He was also keen to revisit the area which still holds horror images and a memory of the smell that he was still needing to come to terms with. This is a beautiful wooded, mountainous area with many small towns and settlements in all the coves and river mouth areas. The section we visited is repeated for many hundred of miles north and south of here. He told me the story of how only one small town survived undamaged. Many years ago the Mayor of this town had insisted on building the sea defence wall many meters higher than anywhere else had even considered. He was laughed at and his wall was the subject of jokes throughout his lifetime. After March 11 his town was the only one in the area where not a single person died. The very next day the local people began laying flowers on his grave. Because there was no nuclear problem here it is possible for re-building to commence and a few people are doing so. However the sea defence walls have not even been mended let alone increased in size and one can hardly imagine that mortgages or insurance are possible. The fishery businesses whose warehouses were outside the sea walls anyway are all re-building at great speed. 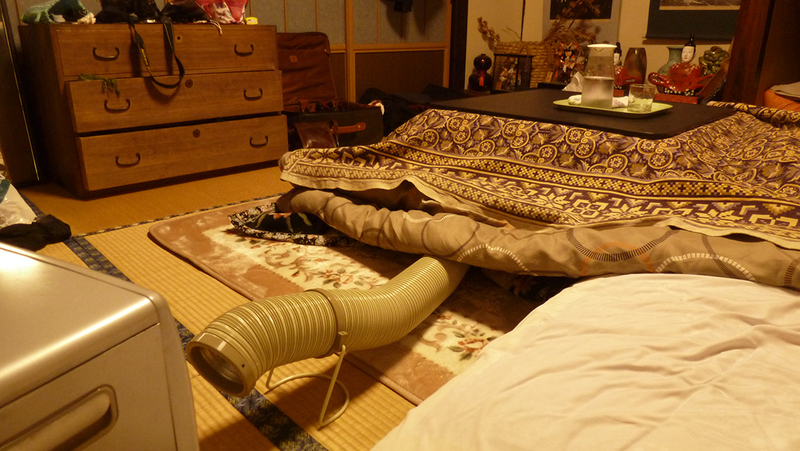 Building contractors in Japan are going to be over employed for many years to come. I have never seen so many diggers at work and doubt that private individuals could get a contractor even if they wanted to. There are still huge mounds of debris at the wharf sides. There is no obvious sorting operation so I think they are being slowly loaded onto ships either for dumping or sorting elsewhere. I haven’t found out about that so far. This area has a large number of refugee houses with people staying close to their localities, but it will surely be very many years before they are able to re-settle in their old locations. Also the stories about Government compensation for these non-nuclear refugees suggests that they will have very inadequate funds. I hear the stories but don’t know the facts. Tsunamis have always been taken very seriously in this whole area with weekly rehearsals and hundreds of well marked high ground shelters designated. But many of these were also inundated this time with others escaping the tide by feet. 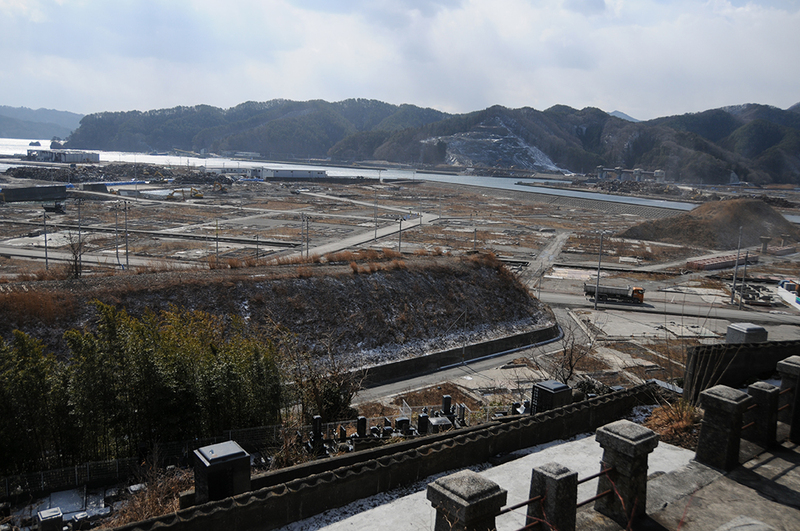 In one area the tsunami went 8 km up a river valley which no-one had forseen. There was a 15 minute warning this time and most people reacted correctly. Without that the loss of life would have been catastrophic. Who knows why some people did not leave their houses? Would we leave if we had a bed ridden old person in the house? If our house had always been safe in the past? In some cases perhaps 15 minutes was just not enough time. Hospitals certainly did not have enough time to evacuate bed-ridden patients. There are, as we might imagine, many stories of tragedy – the man who was safe but went to see if his wife was OK and was caught by the unexpected third tide. But also of survival – I am told the story that one lady recounted – when she felt the tremors a few days beforehand she had drilled her children that if the siren sounded, no matter what anyone else was doing, they must run up the hill to their school. As it happened they were at the school anyway when the tsunami came. She, on the other hand, was driving back on the motorway from another area and as she reached her town she and all the other cars were swept off the road and into the raging soup of debris. As her car was sinking the windscreen was hit and broken by a concrete electricity pole. She undid her seat belt and pushed out through the hole. She was instantly swept up into the racing debris, but eventually managed to climb onto a floating wardrobe. As she was swept in towards the hillside she tried to scramble up onto a wall but couldn’t because of the thick mud. Some people saw her and ran back to help and after several attempts managed to grab her and drag her up. In a totally dazed state she ran up the hill where she found her children safe. A few days later she went back to see if her car was still there and was met by security officers who told her that she was mistaken, her car couldn’t possibly be there because everyone in those cars had died, they had just finished removing the bodies. She was the only survivor. She reputedly told this story in a completely un-emotional way. She understood it was just one story among many. Food contamination is another issue I have tried to ask about. Generally the first Government caesium testing figures were not trusted as most people seem to consider that Government is too tightly allied to big business who might be exerting pressure to falsify the figures. However there were many independent tests made in Japan and in other countries around the world which have indicated that with a few early exceptions which were dealt with, the levels pose no serious risk. This has produced two kinds of response. There are those who make a point of buying local food to support the beleaguered farmers and those who buy from the furthest away sources as possible, trusting foreign food above Japanese. Generally though I haven’t seen any particular paranoia about radiation anywhere locally. Life just goes on as normal – but without the tourists whom they so desperately need. Su’s reports provide us with eyes and ears in a place that has suffered a catastrophic natural event with huge consequences on human technology and society. At this point we are only able to share in Su’s bearing witness, two years later, to the continued impact. 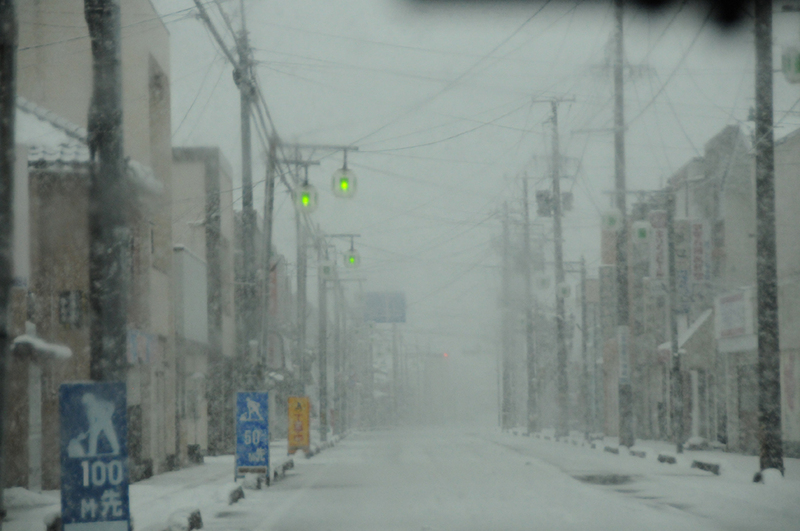 Yesterday we set off in pretty bad conditions for the long journey to Minamisouma City. As always snow that would have brought the UK to a standstill seemed to make no difference here. With winter tyres everyone seems to drive normally. We did see a couple of lorries with issues, but generally people just seem to ignore the weather. 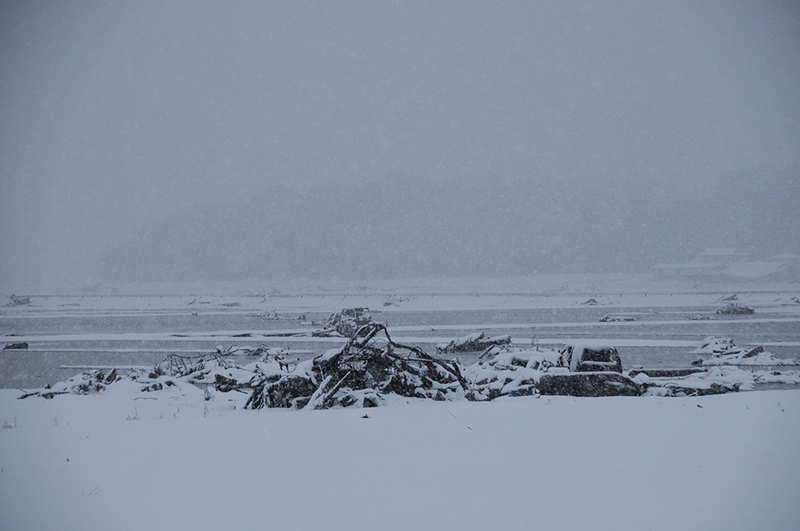 Ms Kobyashi, a curator from Izsu Kawamatsu Museum, willingly drove us for 9 hours in dreadful conditions. The Director of Minamisouma City Museum then acted as our guide to visit the disaster area which is nearest to the nuclear disaster site. We carried radiation monitors in the car (you can buy them in the Home Centre) and although these increased as we went further in to the area, the level was mostly below that of the city Kitakata where we are staying and only once reached the daily level of the city of Oslo in Norway so nothing to worry about for us. Outside it is a different story, miles of empty houses including whole villages with cars, lorries and tractors left abandoned because they are too contaminated to be moved. The ghost towns with their traffic lights still working are an eerie and disturbing sight especially in near blizzard conditions. Houses of all sizes are left abandoned with police patrol cars driving round as protection. These black & white cars with their silent red rotating beacons add an almost holocaust atmosphere as they glide around the empty roads. Apparently the public are not allowed within the 10 km zone, but because we were in an official car it was allowed – I still got the feeling we were being followed with red lights suddenly appearing nearby. Ex residents are allowed back to visit their property in the 10 – 20 km area, but are not allowed to live there. Some are allowed to plant their land and for one year will get paid by the Government for the difference between their previous and current value – hopefully no-one would buy. Presumably this is an attempt to de-contaminate the land but I couldn’t clarify that and I also don’t know if it is only after top soil has been removed. I have to add that all I write has been gleaned through non-professional interpreters and there is often difficulty in putting follow-up questions. However I feel it is worth recording what I hear and see. There is work already going on to remove the contaminated top soil from the rice fields and we actually drove past the site where they are to dump this stuff. No one wants to have it near them so it is being sited in the conveniently flat and empty land of the Tsunami aftermath – clearly an area which could be flooded again should the worst happen. We drove to the broken sea wall and saw piled up broken houses and cars still rotting on the now flattened land. We saw houses that survived against all odds sometimes turned completely round and what looked like a bungalow was actually a top story of a larger house just lifted off and deposited elsewhere. From one refugee at our house we have learned that two days after the earthquake and Tsunami the people in the two villages closest to the reactor were simply told to get out immediately, they were not told why, or where they were to go or how they were to go: just to get out. Of course word quickly spread and others in the area all started to leave as well so that the roads were blocked. There was no petrol and no one knew how far away to go. Quickly centres were set up in schools and gymnasiums but they were soon over full and lacking in food. We were told that the food was sitting in lorries at the edge of the safety zone but no drivers would bring it further. Another problem was apparently that in the interests of equality the food distributors of the centres would only hand out food if there was enough for everyone. Those making the food didn’t know how many to cater for so if they made 1,500 rice balls and there were just 1000 people then the remaining 500 would be thrown away rather than try to find a way to distribute it fairly. Of course it is easy to imagine how such stories could spread but it has been well documented that these people were hungry. They didn’t want to leave before finding out if family were alive or located, which was in turn made very difficult by the fact that there was very little mobile or internet connection. Again we were told that after a short time the government announced that all refugees could travel without paying the hefty toll charges on the motorways but since they had no identification they had to argue their case at each toll station. They were also given a code to get free cash from ATM machines to help them travel. When I see all the contaminated cars that cannot now be moved I wonder what state the cars were in when the refugees left in them – and that they are still driving round. Our refugee also heard that ferries would be free so he drove north to get the ferry to Hokkaido but the ferry company had not received official instructions so would not let him travel. He spent two nights in the waiting room there, with local people bringing him food, before turning back. 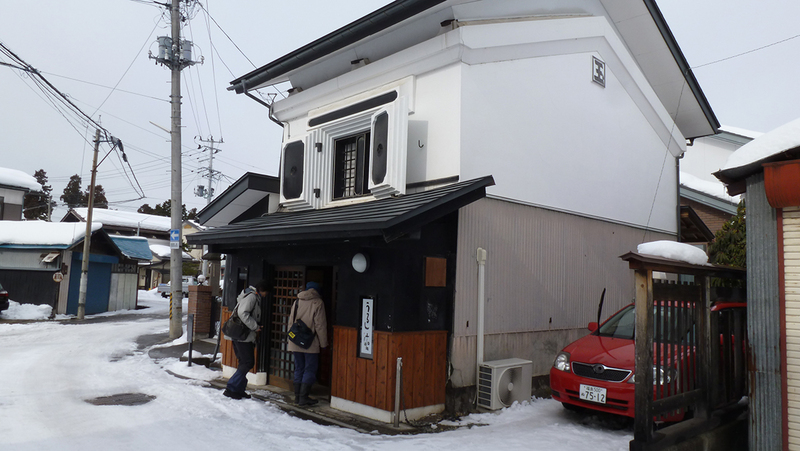 He stayed in eight different places before a friend told him about this place – where Yoshoko and I are also now staying. It is hearing the personal experiences that brings home the enormous difficulty that any country in a similar situation would face. Even after two years some refugees (I don’t know what percentage) do not know what their compensation will be. The paperwork is so complex that even with support some are unable to cope and are walking away without claiming. Others are fighting for a better deal. We are told that charities are making all household goods available free of cost to refugees so that they can furnish a new house when they get it, but the temporary houses are so small they have nowhere to store it. On the Japanese news last night a programme showed 6 Nuclear reactors that have been found to be straddling actively moving fault lines and I am told that one of these is still in production (but that needs to be verified). 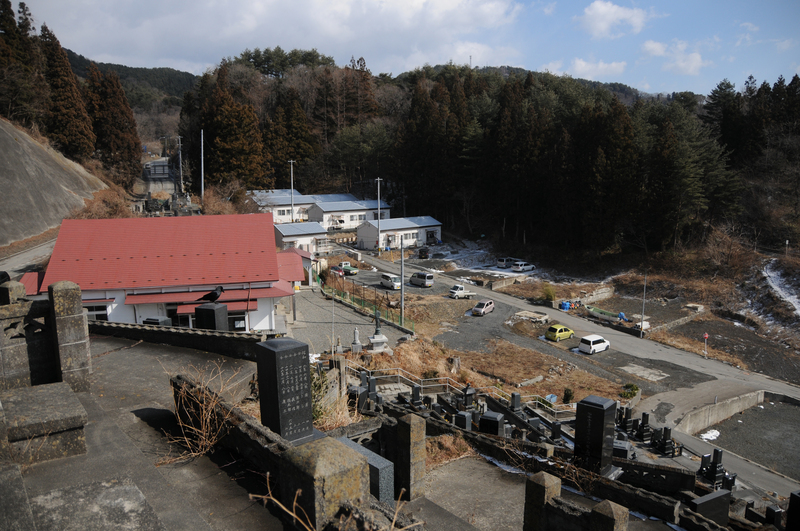 Even if these sites are closed presumably they all still contain radioactive core material. With all but two of their reactors shut down, Japan has very high electricity costs and people are extremely cautious about its use. But if they really want to make a difference then they have to insulate their houses and start using renewables which are almost non-existent here at the moment. It seems to me that there are so many issues it is almost impossible to imagine how any country can cope. The scale of all this is so huge it is only by seeing it that any idea of scale can really be imagined. I was told that in this Province there are 100,000 refuges and 200,000 in the next Province and they are in many other areas besides. The great thing about Japan, which could help, is that so much seems to happen at a local and community level: small scale village businesses and food production; people who share their expertise with others and a general feeling of willingness and helpfulness – especially towards us as visitors. As everywhere, local Government comes in for a lot of criticism. But I have to say that in this very small village there is a beautiful modern Government-funded community centre, and others villages nearby have the same. They not only allowed me to use their splendid kitchen free of charge to make scones for an event for Refugees, but the staff insisted in coming in to help – interesting as we had no shared language at all! So tomorrow we artists are giving a presentation at a Refugee camp about Scotland and Norway. We are providing Norwegian fish soup for lunch – with rice balls – and tea and scones and flapjacks for afternoon tea. Goodness knows how that will work out but hopefully they wont know what scones should really look and taste like. Japanese ingredients and helpers have added a little variety to the final outcome. Report Number 3 from Su Grierson in Kitakata, Fukushima Province Japan. Slowly, as we move around engaging with the locality and people and negotiate the difficulty of translation, we are gaining more insight into the aftermath of the Tsunami two years ago. All the displaced and dispossessed people from the coastal disaster area are referred to as Refugees. This term is general and has value in identifying them, but covers many differences that exist within that community. I have had no sense that the term is disparaging, but we were told that the initial intense sympathy that people held for them has been diminished as certain tensions have arisen. There are Refugee camps in many areas in order to scatter the load on existing communities. The Refugees are housed in temporary purpose-built wooden houses (un-insulated as is common here) which they can occupy for up to 3 years. This deadline was put in place to discourage permanent ghetto-like clusters simply continuing indefinitely and to put pressure on the dispossessed to try and rebuild their lives. Many previous community groups are actually wanting to be resettled together in the areas they came from but this is mainly not possible as the land is not safe for re-building and there are insufficient large areas of free land to build new houses in any quantity. The issue seems to be unresolved. We were told a little about the tensions that exist, and predictably money seems to be a major factor both between the Refugees themselves and between them and the rest of the community. As far as I can ascertain there were two types of compensation. 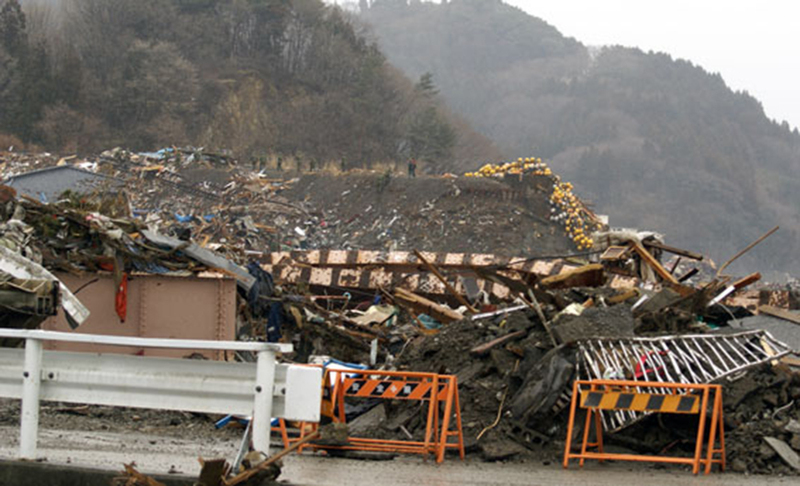 Those living within the Nuclear disaster zones were paid compensation directly from the Nuclear industry and it was generally much higher than the Government payout to those who were affected only by the Tsunami. In addition, the nuclear payment was zoned by the proximity to the fallout area. Even though those living further away also lost everything and cannot return to their homes they received less. No one mentions whether exposure to the radiation is a factor or not. Likewise those who lost everything from the tsunami are receiving much less than those in the nuclear payout zone. It is not hard to see how tensions arise. It seems this has been exacerbated by the fact that some of those receiving large payouts, who have never had so much money before, are not managing it wisely and some are buying fancy cars and living extravagantly and again that does not impress the local people and tests their degree of sympathy and support. It is human nature playing out predictably I think. 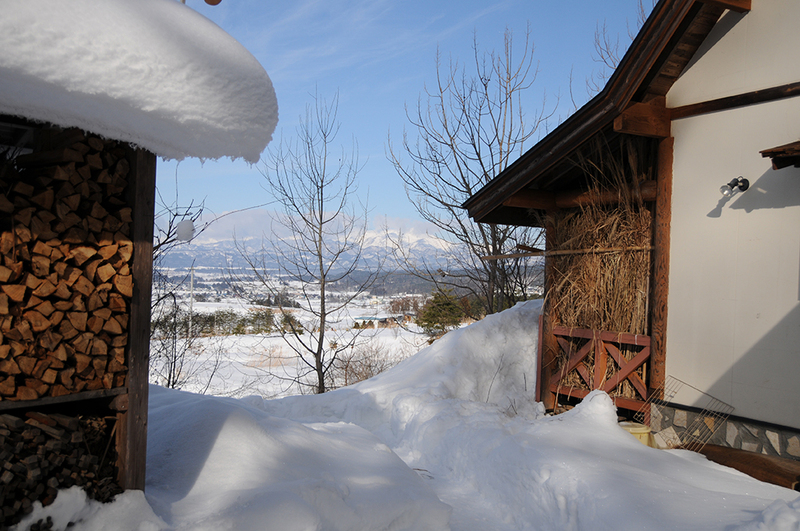 I am now on my third experience of Japanese traditional style accommodation – and yes, I can actually see the snow through the cracks in the single plank wooden wall! This is a large traditional house run by the owner as a B&B type accommodation. She and her elderly mother live in the (newer) building built alongside. This seems to be a common arrangement. As well as Yoshiko and myself there are also a Refugee couple staying here. He is very talkative but I am dependent on Yoshiko’s interpretation which she find quite challenging so I hope to piece together more of the story slowly as the days go by. So far I have gathered that there has been a problem with the Government payout because the system is extremely bureaucratic and that many of the less educated or able people deal with the form filling. A system has been put in place to give individual interviews to help those with problems but some people even then cannot answer the complex questions about their history, income and lifestyle so they simply give up. As for this couple they have moved 8 times in the 2 years, looking for a place to settle. He says he is looking for good water. When I asked why that was so important, thinking it might be something to do with rice growing or fishing, he explained that it was because good water was the source of life. In order to get good human life, good soil and a full eco-system (my word not his) there must be good life-giving water. The area we are in now Kitakata, he says has lots of bears which is good, but lower down the chain of animal and plant life it is missing many things. So it seems they will be off to location number 9 at some stage. At least he managed to get a job here doing night shift at a compost factory. I think he is 68 and took to farming when he retired as a plasterer and before that he worked in the nuclear plant. It would be good to chat with his wife when her talkative husband is not around but she does seem very shy at the moment. Who knows what effect such uncertainty and constant moving around, on top of the catastrophe itself might have had on her. 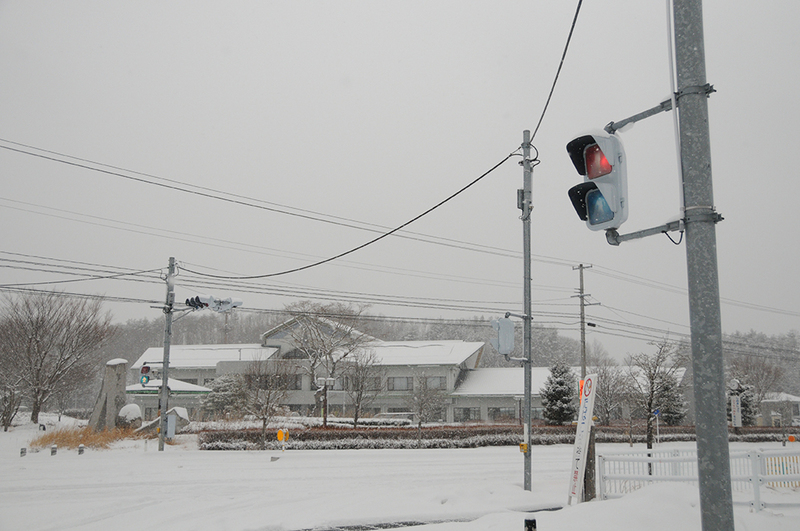 It is snowing hard again today and I must tell you about the way in which they clear the main roads. Down the centre of the roads where we might have ‘cats eyes’ there are little holes through which at appointed times little fountains of warm water (at least I was told they were warm but haven’t tested it) spray out onto the road. It washes away the snow most effectively without any need for the unpleasant salt that we spread with less efficiency. At our first accommodation the same system was used on the outside paths simply using hoses with holes. The country and side roads are partly cleared with snow ploughs and then every car uses winter tyres and everyone just drives on the packed snow base as normal. Because the houses are largely un-insulated and without central heating, and anyway many people are giving up using electricity, the rooms, including our new studio spaces, are heated with ‘paraffin’ heaters (well I am not sure exactly what form of oil it is but it smells like that). Most of them are also plugged into the power supply for control. They do heat up very quickly but cut out when they reach temperature and then the cold comes back all to rapidly so it is difficult to get a comfortable even temperature.